Seven persons were killed on the spot when a Maruti van coming from Greater Noida to Delhi rammed a dumper parked almost in the middle of the road near Pari Chowk under Kasna police station at 9 am today. Two persons were rushed to Kailash Hospital, Noida, in a serious condition. The son of a retired IAS officer and his friend were found stabbed to death in the annexe building of 24, Ananlok, in the upmarket Defence Colony this morning. The victims have been identified as Puskin Chandra (36), a project development officer working for a US aid project for the US embassy in Delhi, and his friend Vishal (27). A married woman tried to end her life and that of her child by jumping into a nearby canal, here yesterday. While the woman was rescued, her nine-month-old girl child drowned. This was the second incident of its kind in the past 10 days. They became pregnant even after ‘nasbandi’! An interesting chapter was added to the State Health Department here when three women, who had already undergone a ‘nasbandi’ operation, claimed to have conceived. The Leader of the House in the MCD, Mr Satbir Singh, today announced that the Deputy Chairman of the Standing Committee, Mr Ashok Jain, who was arrested by the CBI in a bribery case, has been suspended for six years from the primary membership of the Congress party. This decision was taken by the party high command today. The 35th Annual Convocation of IIT Delhi was organised here today. A total of 1,320 degrees were conferred, of which 328 were for B.Tech, 82 for M.Sc, 598 for M.Tech, 78 for M.B.A and 87 for Ph.D. The Delhi Medical Association organised a ‘Service Doctors’ Convention’ on the occasion of its 90th Foundation Day here today. The doctors from the MCD, the Delhi Administration, the ESI, the NDMC and the CGHS participated in the convention. More than half-a-dozen owners of film studios, including “Super Cassette” industries have been served with a show-cause notice by the Noida Authority. Short of mocking at the Government of NCT of Delhi for issuing an appeal by way of advertisement to say ‘no’ to alcohol, the BJP has said that the new, liberal Excise policy encourages consumption of alcohol, and it was strange that the government was playing into the hands of the liquor lobby. About half-a-dozen criminals looted the Adi Das showroom in C-31, Sector-2 after tying the security guard last night. Even as there is much hype about the need to control water pollution, some of the proposals in this regard are facing rough weather due to the apathy of the authorities. Seven persons were killed on the spot when a Maruti van coming from Greater Noida to Delhi rammed a dumper parked almost in the middle of the road near Pari Chowk under Kasna police station at 9 am today. Two persons were rushed to Kailash Hospital, Noida, in a serious condition. 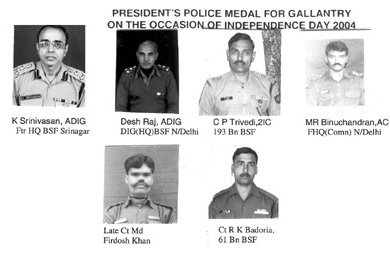 According to Kasna police, Mohinder Singh, Kulwant Varma, Dharam Singh, Trilok Singh, Mahinder Pratap, Satya Vat Abinav Verma, all died on the spot. The van was being driven by Mohinder Singh. Ironically, the victims had taken a lift in the Maruti Van No. DL-2CZ-4169 at Pari Chowk. The van was carrying an engineer of Metro Rail Corporation, O.P. Rai. The engineer who belonged to Orissa, also lost his life. The van belonged to a private travel agency of Noida, the police said. In another accident, an eight-year-old girl Palvi was killed in a collision between a Qualis van and truck near Bisarakh, while seven were injured. Those injured—included Ravi Mittal, Manju, Ritu, Pushpa, and Sachin. All were rushed to a private hospital. The police have registered a case against the unidentified vehicle on the basis of report by one Amit. The Noida-Greater Noida Expressway is fast acquiring the reputation of a killer road. Three major accidents have taken place here recently in which half a dozen persons had lost their lives. In two accidents, fast moving vehicles had rammed trucks parked on the roadside. Despite claims by the administration and Greater Noida authorities, there is no sign of police gypsies and the Expressway is without streetlights. The son of a retired IAS officer and his friend were found stabbed to death in the annexe building of 24, Ananlok, in the upmarket Defence Colony this morning. The victims have been identified as Puskin Chandra (36), a project development officer working for a US aid project for the US embassy in Delhi, and his friend Vishal (27). While Chandra was found with his neck slit and stab injuries in the abdomen, Vishal was found dead in the bedroom with stab injuries in the abdomen. A case of murder has been registered in the Defence Colony police station and the police is questioning Chandra’s friends and neighbours, to gather valuable information relating to the murder. 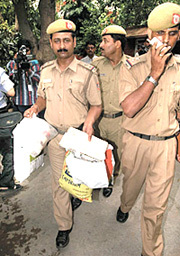 The police has recovered pornographic CDs and other obscene material from the premises which related to homosexuals. The police is investigating the homosexual angle to the murder. According to the police, Chandra’s parents also reside on the premises. Chandra stayed in the two-bedroom annexe. The bodies were discovered this morning when the servant, Hari Ram, arrived at around 11 am to clean the room on the first floor. The servant, on noticing that the door was locked from outside, informed Chandra’s parents and opened the door with duplicate keys. The shell-shocked parents informed the police when they saw Vishal lying in a pool of blood in the bedroom. Later, when the police opened the bathroom Chandra was also found lying dead with his hands tied. The police said that two broken kitchen knives with bloodstains had been recovered from the spot. The forensic experts and dog squads were called in to lift prints from the premises. There was no sign of ransacking and only Chandra’s Opel Corsa car was found to be missing after the incident. It is learnt that Chandra had lived in the US for some time and returned to India in 2001; since then he had been working on a project for the US embassy here. Chandra’s elder brother is also in the US. The police are trying to trace Vishal’s parents and establish contact with them. Chandra’s father A K Chandra is a retired IAS officer from Madhya Pradesh. He had retired five years ago. A married woman tried to end her life and that of her child by jumping into a nearby canal, here yesterday. While the woman was rescued, her nine-month-old girl child drowned. This was the second incident of its kind in the past 10 days. The woman identified as Babitri, wife of one Dinesh, a resident of Etmadpur village, reportedly took the extreme step after a quarrel with her husband. It is learnt that the woman took her daughter and reached the Palla overbridge from where she jumped into the canal along with the child. Some of the passers-by also jumped into the canal to rescue them. They made all-out efforts to save the woman and her child. However, the woman was rescued, the infant died. The body of the nine-month-old girl was fished out later. The police have booked the woman under Sections 304 and 309 of the IPC. This is the third incident in the district during the past 10 days in which the women have tried to commit suicide along with their children. The police had booked a woman of Sector-24 jhuggis here, who had attempted to kill herself and her three minor daughters, by jumping into the Gurgaon canal, last week. While the woman survived, her minor daughters drowned. In the second incident which took place about four days ago, a poor woman had jumped off from the Bata flyover on to the track below, along with her two minor children. In this case also the woman survived, but her children were killed. A family dispute is stated to be behind these incidents. The police have booked the women in all these cases under various sections. In all the cases, family dispute was said to be main cause which led the victims to end it all. The three pregnant women have now sought compensation from the Health Department to look after their children. Bala, wife of Sardar Singh of Bhoorbaral village, had undergone the operation on April 24, 2004. Dr Bhutan and Dr Gayatri Devi operated upon her at the Primary Health Centre (PHC), Bhoorbaral. The PHC, Bhoorbaral, had also issued a nasbandi certificate to this effect. After three-and-a-half months, she discovered that she was pregnant. She had not been sure earlier, but the doctors’ reports confirmed that she was expecting. In another case, Savita, wife of Amit, resident of Fatehullapur village, also stated in her complaint made to the State Health Department that Dr Rukma Idnani of Meerut Medical Collage had operated upon her on May 19, 2003. But after an ultrasonography examination on April 29, 2004, it was confirmed that she was pregnant. She also possesses a nasbandi certificate. Another victim, a mother of four children, Rati, wife of Kawarpal, resident of Alam Gir village, also revealed that she had undergone a family planning operation in a health camp held at PHC Rohtak block a year ago. On May this year, she had gone to the PHC Rohtak for a medical examination. A lady doctor declared that she was pregnant. Doubting over the examination reports, she got herself examined again at a private clinic. Here again, the doctor confirmed the news. Ironically, all the victims have alleged that the doctors and officials at the Public Health Department, Rohtak, had kept them in the dark. All the victims were declared pregnant after having been examined by the private doctors. When they tried to abort the babies, they were told that the time of abortion had already passed. The victims have four to five children each. Now, they are demanding the compensation from the state health department for looking after their children. They will move court if their demands are not met, one of the victims said. Meanwhile, speaking to The Tribune, the Chief Medical Officer (CMO), Meerut, said that these women had already been given some money after the operation. Mr Ashok Jain, who represents Bazar Sita Ram segment of the Corporation, was a senior corporator of the Congress party. He has been elected twice from the area. This was his third term as the Deputy Chairman of the Standing Committee. Mr Jain had unsuccessfully tried for the posts of the Chairmanship and Mayor. He had worked with Mr Ram Babu Sharma, the former Chairman of the Standing Committee, who had resigned from the membership of the Corporation after he was elected the MLA from Rohtas Nagar Assembly constituency. Mr Ashok Jain has been member of a number of powerful committees of the MCD, including the Municipal Accounts Committee and the Appointment Committee. His arrest in the bribery case was a major source of embarrassment for the party, sources said. The CBI sources said that the agency was keeping a close watch on the activities of Mr Ashok Jain for the last couple of months. With the arrest of three persons of the notorious Bawaria gang, the West district police claims to have worked out at least 25 cases of dacoity, burglary and thefts in various places in the national Capital. The police also claimed to have seized spring-actuated knives from their possession. The accused persons were identified as Om Parkash alias Chuni Lal, resident of Pandav Nagar, Kallua, resident of Tilak Nagar, and Mahabir Singh of R.K. Puram. However, two of their associates, identified as Kallu and Ram Chander, managed to escape. The police said that the accused were involved in several cases of burglary and theft in Lajpat Nagar, Okhla, R.K. Puram and Vikas Puri. The Anti-Corruption Branch claims to have arrested a House Tax Inspector of the MCD for demanding a bribe of Rs 5,000 from a complainant to reassess his property. The accused, Sahiram Tanwar, Area Zonal Inspector, initially demanded a bribe of Rs 9,000 from the complainant Kashyap Mankodi but later agreed to accept Rs five thousand. The cops of the Metropolitan Police and the children of Prayas, an NGO working with street children, share a special relationship. Mr Tim Blair, a senior police officer of the Metropolitan Police along with his team, spent a day with the children of Prayas at the Garden of Five Senses, Saidulajab, yesterday. The children presented a colourful cultural programme. The children interacted with the police officials, which turned out to be an event in socio-cultural exchange. The team of volunteers from Ireland also enthralled the audience with their performance. The Distinguished Alumni awards were presented to Prof Madhu Sudan, Mr Akhil Gupta and Ms Padmashree Warrior for their contributions as ‘thought and knowledge leaders’ in their respective fields. Executive Officer, Corporate Development at Reliance Infocomm. Prof. C. N. R. Rao and Mr G. Madhavan Nair were awarded the Degree of Doctor of Science (Honoris Causa) for their outstanding contributions to science and technology. The President’s Gold Medal was awarded to Varun Gupta, Department of Computer Science and Engineering, for obtaining the highest CGPA in all disciplines. The Director’s Gold Medal was awarded to Aditya Jhulka, Department of Biochemical Engineering and Biotechnology. Kaushal Dhimant Joshi of the Department of Civil Engineering was awarded the Dr Shankar Dayal Sharma Medal for Best General Proficiency. The problems being faced by the different service wings were discussed and a memorandum was submitted to the Health Minister of the NCT of Delhi, Dr Yoganand Shastri and the Union Health Minister, Dr A. Ramdoss. Dr Yoganand Shastri was the chief guest and Dr S. P. Aggarwal, Director General of the Health Services, Union Government, was the guest of honour, a press release said. Australia is the second most sought after overseas study destination for Indians, with more than 14,000 Indian students in Australia in 2003. Keeping this in mind, IDP Australia, organised an education fair in Delhi, which was attended by more than 30 Australian Universities offering different technical courses. Of the top 10 source countries for students coming to Australia, there was 27 per cent growth between 2002 to 2003. 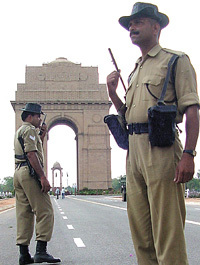 IDP Australia has its centres in Delhi, Chandigarh, Mumbai, Chennai, Bangalore, Ahmedabad and Hyderabad. IDP is also offering short-term courses, such as the English language testing system that has been started for the first time by the institute in India. The contents for the course is provided by the Australian Centre for Languages (ACL), a leader in English language teaching and e-learning resources and support devices. The studios have been asked to reply within 15 days as to why their allotment should not be cancelled as they had increased the covered area after obtaining the completion certificates from the authority. Some of the studios have been found guilty of subletting their premises without seeking permission while some have indulged in other illegal activities, but film shootings. There is commotion among the studio owners since Yash Chopra’s studio was first cancelled and later restored on payment of penalty of several lakh rupees. On July 31, the authority had issued a show-case notice to Super Cassette industries for having undertaken construction by extending floor area without prior approval. On July 12, notices were issued to FC-17, B.C. Century Communications. The studio owner was asked to explain why it had sublet the premises to an independent news channel. FC-6 – Prasad Productions has also been issued a notice for doing no shooting in the studios. FC-7 has also got a notice for having constructed some new portions at the back of the studios. FC-11 Images Entertainment Ltd has been served a notice for having sublet their premises to E TV. FC-10 Padmini Tele Media has got a notice for not commencing shooting in the studios. FC-17-A First Channel Media P Ltd has given the entire premises to the movie producers on rent. According to sources, the Noida Authority will wait for the time given to the studios for reply and then take further action. The President of the Delhi Pradesh BJP, Dr Harshvardhan, has criticised the Excise policy on the ground that it would turn NCT of Delhi into a bar and promote consumption of liquor among the youth. “The revenue earned from sale of liquor will be far less than what the government will spend on dealing with the liquor menace,” he argued, and listed unemployment and crime as some of the disastrous consequences of allowing pubs and bars to stay open up to 1 pm. In a similar vein, Dr Harshvardhan sought the dissolution of the Municipal Corporation of Delhi (MCD) since it has become a “den of corruption” and demanded that fresh elections be held. The arrests of Hiren Tokas, Khazan Singh and Deputy Chairman of the Standing Committee Ashok Jain, he said, indicated the extent of the rot that had set in the MCD. The assailants, who decamped with valuables worth Rs 2 lakh and Rs 5,000 in cash, had also damaged the showroom. The police have detained the security guard for questioning. This is basically a garment export showroom. The intruders had broken open the showcases to take the goods displayed there. SO Sector-20 police station Santosh Yadav said prima facie it appeared to be a case of complicity of security guards. The security guard who was to resume duty at 8 am had not reported for duty, which has confirmed the police suspicions. The police are looking into all aspects of the case and going to interrogate the security guards, especially the one who made himself scarce on the day of robbery. A survey report by the Delhi-based Central Pollution Control Board (CPCB) revealed that there has been limited action on the Water Pollution Treatment and Control (WPTC) Ordinance, passed earlier by the Union Government to check the rising water pollution level in India. Under the Ordinance, it was proposed that Sewage Treatment Plants (STPs) and Common Effluent Treatment Plants (CETPs) would be installed in all the major cities of India. Besides some work in the metro cities, there has been no initiative in the smaller cites. More importantly, there is no arrangement for the treatment of industrial byproducts from the unorganized industrial sector. Noida police have at last nabbed the main accused Aman Singh, for the murderous attack on Sector-22 Gandhi Smarak School Principal Jaswant Singh and murder of Principal’s son Rajeev last Sunday. A pistol has been seized from Aman Singh. Khem Chand, Aman Singh, Dharmender Sharma, Vijayender Singh and two outsiders had been named in the report filed in Sector-24 police station. Khem Chand has already been arrested. SO Sector-24, Veer Vikram Singh said the police had received the information that Aman Singh was trying to flee Noida. He was nabbed early in the morning near Metro Hospital and a pistol recovered from him.